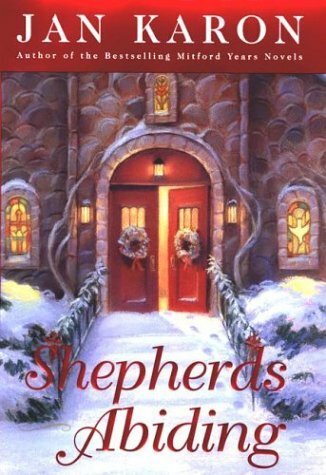 I recently returned to the world of Mitford and indulged in Jan Karon's "Shepherd's Abiding," a touching Christmas story featuring Episcopal priest Fr. Timothy Kavanaugh. I am a fan of the Mitford series and have read many of the books, however one could pick this one up without any prior knowledge and still enjoy it immensely. Fr. Tim bravely takes on the project of fixing up an old battered nativity scene to present as a Christmas gift for his wife, despite the fact that he has no idea how to do this. Meanwhile, other Mitford residents are facing change and upheaval in their own lives. One can't help but love this motley crew of characters and care about their lives. This quote from Mother Teresa was today's Living Faith reflection. God love me. I'm not here just to fill a place, just to be a number. He has chosen me for a purpose. I know it. He will fulfill it if I don't put an obstacle in his way. He will not force me. God could have forced Our Lady. Jesus could have come just like that. The Holy Spirit could have come. But God wanted Mary to say yes. It is the same with us. God doesn't force us, but he wants us to say yes. 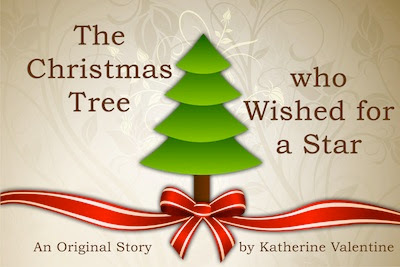 Stop by Catholic Mom and read a wonderful short Christmas story by Katherine Valentine. It's perfect for reading to the kids or simply enjoying yourself. It is time once again for the Christmas Novena. It begins on Tuesday, November 30th and goes through Christmas Eve. It is time to prayerfully consider what we want most for Christmas this year and bring those desires to God. I've seen different versions of how to say this novena - some say to say it 15 times a day while others have it as just once a day. However you do it, humbly request God for the blessings that you desire most this Christmas. The past few years, my children and I have put up a Jesse Tree to mark the days of Advent. Looking at our various Advent traditions and feeling a bit overwhelmed by them all, I thought I might skip it this year. My children had a different plan. In fact, in Church on the 1st Sunday of Advent, my younger son leaned over to me and whispered, “Mom, we need to do the Jesse Tree,” with as much urgency as he could possibly muster at that moment. Yes, this is one tradition that will not be faded out any time soon. And, despite my initial reluctance, this is a good thing. Here are the words of my Bishop, Bishop Timothy McDonnell, on the start of Advent. They were written in "The Catholic Mirror," the magazine of the Diocese of Springfield, MA. On each of the four Sundays of Advent, as an additional candle is lit, you might want to reflect on a particular aspect of God's presence in your life. C: Christ came to us the first Christmas. O: Christ comes to dwell in others and ourselves. M: Christ is present to us at Mass and in the sacraments. E: Christ will come again at the end of time. In other words, Advent is not simply a season in which we get ready to celebrate Christmas. It is not merely a time in which we consider the way God set the stage for the birth of Christ. Advent is more. It is a time to pray, "Come, Lord Jesus. Come to us as once You came at Bethlehem. Come and help us see your presence in us and in others. Come and deepen our recognition of you at Mass and in the sacraments. Come to make all things new." Movie Review: "Letters to God"
Before you sit down to watch Letters to God , I strongly suggest grabbing a whole box of tissue to bring with you. By the end of this movie, you are definitely going to need it. Tyler Doherty is an 8 year old who is battling cancer. His way of praying is to write letters to God. He has one for the mail carrier almost very day. Brady, a man whose life has fallen apart and who seeks solace in alcohol, is a new mail carrier who takes over the route. On his first day, Tyler pukes on his shoes. Nevertheless, he and Tyler soon become friends. He still isn't sure what to do with all of his letters to God, however. In time, both his friendship with Tyler and his family, and the letters himself will change his life. The idea of writing letters to God takes off and by the end of the movie, many people have joined Tyler in praying in this matter. This movie just may inspire you to write one or more of your own to God. This is truly an amazing, heartbreaking story about faith and trusting in God even when all seems hopeless. It is rated PG and is appropriate for ages 7 and up (due to subject matter). As an added plus, Ralph Waite (the father from "The Waltons") does a remarkable job as the grandfather of Tyler's best friend Sam. More from "The Confessions of St. Augustine"
I definitely need to finish this book . . .
For Thou shalt light my candle, O Lord my God, Thou shalt enlighten the darkness; and of Thy fullness have we all received, for Thou art the true light that lighteth every man that cometh into the world; for in Thee there is no variableness, neither shadow of change. But, Lord God of truth, does a man please you by knowing all these things? For the man who knows them all, but does not know you, is unhappy, and happy is the man who knows you, even if he does not know these other things. And he who knows both you and them is not the happier because of them but is only happy because of you, if knowing Thee, he glorifies Thee as God, and is thankful and becomes not vain in his imaginations. Who else is it who calls us back from the death of error, except the life that does not know death, and the wisdom which, needing no light, enlightens minds which are in darkness, that wisdom by which the whole world, even to the leaves of trees drifting in the wind, is governed? New York Times Bestselling writer Karen Kingsbury has weaved another compelling, inspirational story in "Unlocked." Holden Harris is an eighteen-year old locked inside himself. When he was three, he withdrew into his own autistic world, a world his mother Tracy has been trying desperately to release him from. Autistic children like routine. Part of Holden's routine is to watch the same movie every day after school - a home movie that shows him playing with his best friend from childhood - a beautiful little girl named Ella. When Ella meets him again in their senior year of high school, she doesn't remember him but something about those blue eyes seems so familiar. One thing she does know is that he loves music and she advocates for him to be able to listen in on her music/drama class. That act of kindness will open the door to an eventual miracle. Kingsbury has also included a secondary plot about bullying including a teen suicide. This is a topic that has had a great deal of media attention lately and she handles it well and with compassion. As I read this book, I felt somewhat disheartened. It is a wonderful story and I do believe in miracles, but so many children today have autism and the vast majority of them won't ever get a miracle. It really seemed like a great deal of wishful thinking (although that is certainly allowed in fiction.) It wasn't until I read the "Reader Letter" at the conclusion of the book that I discovered that it was loosely based on a real-life autistic miracle. Music had brought this young man out of his inner world and given him back to his family. That "Reader Letter" made me cry more than the book! "Unlocked" is a quick read, great when you just want to lose yourself in a story. It will keep you turning pages, eager to find out what happens. It is, in turns, both extremely painful and incredibly heartwarming. In the end, God conquers and triumphs over all. He speaks of embracing a “‘vocation of location’ in which we make and maintain a particular place of belonging in the world.” That vocation can include a whole list of domestic duties. These are the things that we are so familiar with – cleaning, doing the laundry, cooking, doing dishes, paying the bills, etc. Those are all important and necessary tasks, but home should mean more than that. Sometimes moving to a new geographical area is necessary. It can be part of a God-given calling. However, there is something to be said for making a commitment to a certain area, for putting down roots and staying there through thick and thin. Even in an era when we can keep in contact with friends and relatives around the world with a touch of a button, face-to-face relationships are still vitally important. There is no replacement for the friendships and family relationships that develop by spending quality time with others over a number of years. Watching children grow up, sharing meals, knowing and trusting your neighbors, worshipping together – these are the things of which true homes are made. In this holiday season when so much emphasis is placed on home, it is a good time to think about what it means to create a sense of home. How can the environment we create within our own four walls then carry out to the world at large? How can we better commit to the people who share our house, our extended families, our neighborhoods, and our churches? Are you a Catholic Fiction writer or know someone who is? I encourage you to submit your novel for consideration in the Catholic Arts and Letters Award sponsored by the Catholic Writers' Guild. The CALA shall be awarded at the CWG conference/CMN tradeshow each year for books published in the previous calendar year, and bearing a copyright date for that year. One book in each category will be awarded when there are at least five books in a category, and the judges deem that at least one book in its specified category is worthy of the award based on scoring criteria. The award committee and judges reserve the right to not offer the award if it is determined there is not an award-worthy book entered. Only full-length print books, in the form of hardcover or bound paperback, will be considered. No e-books at this time, but those may be considered next year. All submissions must be published in North America in English. Books may be submitted between April 1st and December 31st of the year in which the book is published. Books should be submitted in finished form, not galley presentation. Prize shall consist of a trophy for each category. No monetary prizes will be awarded. Winners, or a representative for the winner, must be present at the award ceremony, which will be held during the CWG conference/CMN trade show. The CALA is an award for outstanding FICTION, and will be awarded based on literary merit. Because the CALA is a new award, this fledgling year may be limited to one award, unless there are sufficient entries to justify additional awards as described below. However, all books will be judged according to genre guidelines even if only one is offered, and therefore genre should be designated on the entry form. Each sub-category must have at least five entries to stand alone. This category includes all historical stories from biblical through mid-1900’s, including historical romance. This category may be divided into additional sub-genres when there are five or more submissions in that sub-genre. All remaining entries will be grouped together for a single award in the general Historical Award. Genre is to be designated by author/publisher on the application. Separation into such categories will be at the discretion of the committee based on number of submissions as of January 1st of the judging year. Scoring will take into account which sub-genre, style and setting is used. • Young Adult fiction—includes all sub-categories, intended to reach teen readers through age twenty. • Romance—stories in which the romantic intrigue is the primary focus. Includes dramatic romantic plots (excluding historicals—see above). Includes titles that are light in tone and theme. • Suspense—mystery, adventure and thriller stories where terror, the unknown, or solving a crime are the main focus of the plot. • Biblical—General fiction of Biblical times. This category may be divided into additional sub-genres when there are five or more submissions in that sub-genre. All remaining entries will be grouped together for a single award in the general Contemporary award. Genre is to be designated by author/publisher on the application. Separation into such categories will be at the discretion of the committee based on number of submissions as of January 1st of the judging year. • Contemporary—stories dealing with contemporary issues set in modern times. (1960-present), excluding romance, unless there are too few romances for a separate category. • Romance—contemporary stories in which the romantic intrigue is the primary focus. Includes dramatic romantic plots. Includes titles that are light in tone and theme. • Visionary—science fiction, futuristic, and fantasy titles. Any work in which the setting is outside the historical or contemporary known world. Stories may include high technology, magic or other unknown elements. Children’s fiction, including picture books, early readers and middle readers. Illustrations and presentation will be considered in the scoring. Advent starts next Sunday. 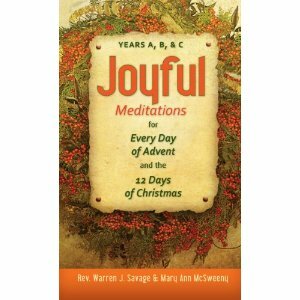 Joyful Meditations for Every Day of Advent and the 12 Days of Christmas: Years A, B, and C will help you focus on the spiritual during this busy season. It was written by Fr. Warren Savage (who I was fortunate to have as a teacher) and Mary Ann McSweeney. What I like about this book is that it covers the full cycle of the liturgical readings and can therefore be used year after year. Opening each daily reflection is a Scripture quote from the day's readings. The reflection then reaches out to us in our busy lives to consider what God's Word has to offer us during the holidays. Next, a thought to ponder brings home the message for you--to really apply the reading and reflection to your life. Now say a Prayer, an offering and petition to the Lord in our anticipation of his arrival; finally a practice, a chance to change your daily routine in simple ways to bring God's love to your life this joyous season. I've been meaning to post about this all month. Meanwhile, November has been slipping through my fingers. In the Oct. 24 - Nov. 6 issue of National Catholic Register, there was a wonderful article on Susan Tassone. Her "one-woman mission and ministry is to help everyone know the whys and the how-tos of helping those in purgatory." Her latest book, Praying with the Saints for the Holy Souls in Purgatory is considered "the encyclopedia on purgatory." So, then, what can we do, not only in this month of November, but throughout the entire year, to remember those souls who have gone before us. Offering Masses for the dead, whether for a particular person or for "the souls in purgatory" is the most efficacious means of helping these souls. Offering the rosary or other prayers for them and offering up sacrifices to help them are other ways to be of help. We are all part of the communion of saints. Let us remember those who are in purgatory and help them in every way we can. There can be no true friendship unless those who cling to each other are welded together by you in that love which is spread throughout our hearts by the holy spirit which is given to us. Blessed is the man who loves you, who loves his friend in you, and his enemy because of you. He alone loses no one dear to him, for they are all dear to him in one who is not lost. Annulments are one of the least understood aspects of Catholic teaching and practice. 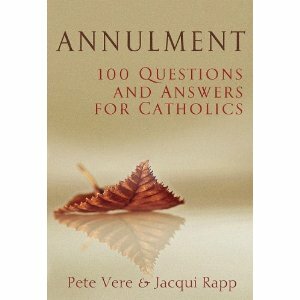 I saw Annulment: 100 Questions and Answers for Catholics referenced on Facebook today and thought I would forward the information on to you in case anyone was interested. The author's website is http://kycanonist.com/. 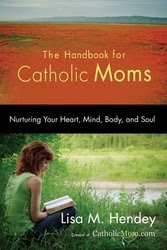 Lisa Hendey just announced that there is now a free discussion guide to go with her book, The Handbook for Catholic Moms: Nurturing Your Heart, Mind, Body, and Soul . Are you in need of editing for any project, big or small? A good friend of mine (and her husband) have just started an editing service. Please check out their website at Iris Editing. Kathy Schiffer has a very good blog post up - I Can't Sin - I Never Even Leave the House - An Examination of Conscience for Seniors. While geared toward seniors, the sins she lists can just as easily apply to any one of us, regardless of age. "Care for Creation" by Christy Baldwin is a short book for children designed to foster environmental responsibility. 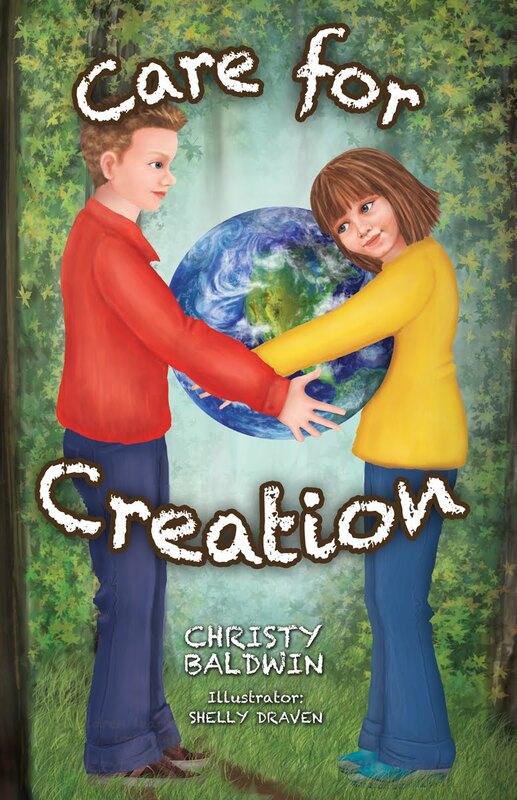 Combining instructional text, quotes from the Bible with charming illustrations of a boy and girl both appreciating and caring for the earth, "Care for Creation" will help foster conversation about what it means to be responsible stewards of God's creation. Ideas promoted include conserving electricity and water, using alternative energy, recycling, walking or biking instead of using a car, keeping our water clean, caring for animals, and planting trees. A brief interactive guide is included at the end of the book. It offers suggested activities and discussion questions. Writing has been a passion of Christy's since she was very young. As a child, she loved to write stories for her grandfather and poems just for fun. She lives in Mason, Ohio with her family and is active in church, Boy Scouts, Girls Scouts and volunteering with various organizations. Christy has a bachelor's degree in Elementary Education from Cedarville University and a master's degree in Special Education from the University of Scranton. She is a stay at home mom who enjoys spending time with her kids and being involved in their schools. Her previous children's titles include Nine Things Nathan Noticed at Night and Remembering Wilma (illustrated children's book with emphasis on great grandparents, the Bible and family trees) . I had the great pleasure of helping to welcome several young children into the Catholic Church today. I love attending baptisms. They are such hope-filled occasions. Each of the persons being baptized has a role to play in our Church. They were sent here by God for a particular purpose and our Church is not complete without each one of them. The presiding priest did a wonderful job of explaining each part of the ceremony. When he was about to anoint the children with the sacred chrism, he described how this set the child apart and united them with Jesus’ mission as priest, prophet and king. Our baptism should matter. It isn’t merely a one time event. Admittedly, like the children who became part of the Church today, most of us don’t remember our reception of the sacrament. Our parents and Godparents made a commitment to the faith for us. Yet, even though we were unaware, the sacrament still changed us forever. As Christians, we are called to be set apart. We are called to holiness, to live according to the teachings of Christ. We should be different from the world at large. People should be able to tell that we are Christian by the way that we live our lives. Do we live out that call to be “set apart?” How can we improve the way we live out our baptismal commitment? In a recent article, "Making the Time," in the National Catholic Register Father James Kubicki states "The Morning Offering is a simple yet profound prayer. In it we thank God for the gift of the coming day and we show our gratitude and love by making an offering of it to God." Someone wrote me to inform me that Morning Star in West Springfield, MA moved across the street. I wasn't able to confirm that information on-line, but I will take them at their word. Next time I'm in that neighborhood, I will check it out. I recently had to purchase a Baptism gift. I really wanted to purchase something Catholic (or at least Christian) related. I was thinking of a child's cross to put on the wall or something similar. I attempted to go to Morningstar in West Springfield only to discover it has closed. I went to several stores at the Holyoke Mall only to come up empty (there may be a store there that sells them, but I wasn't in a position to visit ALL of them). By this time I was totally frustrated. Yes, I could have ordered something from one of the many quality Catholic goods stores on-line, but I didn't have the time to wait for it to be sent to me. http://www.christianoccasion.com came to my rescue. It is an online store, but it is based in Longmeadow and the owner will allow you to pick up items directly from her if you can't wait for shipping. I was able to get a small cross featuring a praying little boy and a set of blue rosary beads within a couple hours of ordering on-line. I heartily recommend the owner and the site! Asking for prayers for a young girl from my homeschooling group who has a growth on her brain. She is going to Boston next week for tests. Today's Gospel reading (Lk 17:11-19) features the story of the 10 lepers who were healed by Jesus and the one that came back to say "Thank you." I have always received healing when I have cried out to Jesus, but never quite in the way I expected. God isn't one to follow my instructions (thank goodness). He always has a better idea. The critical point is to realize I have been healed and be attentive enough to discover what God is doing to heal me his way. God gives me so much more than I initially ask for. Michelle Buckman on Writing "Rachel's Contrition"
I recently read and reviewed Rachel's Contrition by Michelle Buckman. I saw these advertised in the National Catholic Register and I just had to post about them. 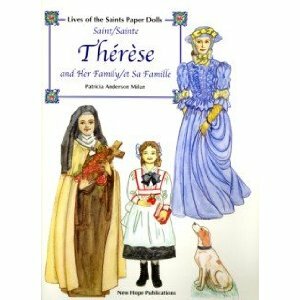 I loved paper dolls when I was a girl and I know I would have loved these: St. Therese and Her Family Paper Dolls . They also have St. Joan of Arc Paper Dolls . 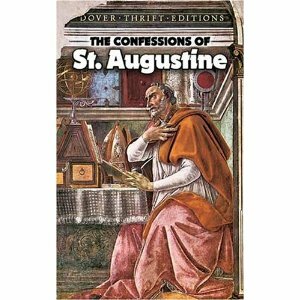 I'm slowly making my way through The Confessions of St. Augustine . It is a book best taken in small doses and pondered. I will love Thee, O Lord, and thank thee and confess unto Thy name, because you have forgiven me these great sins and these evil doings of mine. To your grace I owe it, and to your mercy, that you have melted away my sins like ice. And to your grace too I owe the not doing of whatever evil I have not done. For what evil might I not have done, I who loved crime simply for crime's sake? Yes, I own it: all these evils have been forgiven me - both those which I committed of my own will and those which, because of your guidance, I did not commit. My mother, your faithful servant, was weeping for me to you, weeping more than mothers weep for the bodily deaths of their sons, For she, by that faith and spirit which she had from you, saw the death in which I lay, and you, Lord, heard her prayer. . . .My mother asked this bishop to be so kind as to discuss things with me, to expose my mistakes, to unteach me what was bad, and to teach me what was good; for he used to do this, if he found suitable people for his instruction. However, he refused to do so in my case, and very sensibly too, as I realized later. . . .She kept on begging and praying him, weeping many tears, that he would see me and discuss matters with me. In the end he became somewhat annoyed and said, "Now go away and leave me. As you live, it is impossible that the son of these tears should perish." 1) Seek professional help – there is no shame in asking for help. Some cases of depression are so severe that they require medication. If you are at risk of harming yourself or someone else, seek immediate care. Even with milder cases, simply having someone to talk with on a regular basis can be a tremendous help. 2) Keep busy – Keeping your mind occupied with other things helps keep the negative self-talk at bay. Accomplishing a given task can also help alleviate the feelings of worthlessness, at least for a while. 3) Take care of yourself, body and soul – eat well, exercise, and pray. These three things can go a long way in maintaining emotional equilibrium. 4) Invest in some full spectrum light bulbs – I always thought one needed a light box to get any benefit from light therapy, but they are costly so I resisted the idea. Last year I discovered that full spectrum light bulbs can help achieve similar results. These light bulbs are available at department or hardware stores and cost only a bit more than regular bulbs. They come in various styles and can be used in most light fixtures. They made a huge difference! 5) Know that this, too, will pass – It doesn’t seem like it when you are going through it, but the darkness will end. The light will come again. Keep believing in that fact. Revisiting "The Confessions of St. Augustine"
A few weeks ago, a friend of mine asked me about The Confessions of St. Augustine . I couldn't recall much. After all, it has been nearly 15 years since I last spent time with this classic. So, I am rereading it. I've wanted to get into reading some of the "Great Books" anyway, and this one most definitely qualifies. I thought I'd share some quotes with you as I make my way through. "Yet still man, this small portion of creation, wants to praise you. You stimulate him to take pleasure in praising you, because you have made us for yourself, and our hearts are restless until they can find peace in you." "Oh that I might find my rest and peace in you! Oh, that you would come into my heart and so inebriate it that I would forget my own evils and embrace my one and only good, which is you! What are you to me? Have mercy on me that I may speak. What am I to you, that you should demand to be loved by me? That you should be angry with me if I fail to love you, and should threaten me with the utmost misery? And not to love you, is not this in itself misery enough?" Holy and provident Father, You are the Lord of the vineyard and the harvest and You give each a just reward for their work. In your design of love You call men and women to work with You for the salvation of the world. We thank You for Jesus Christ, your living word, who has redeemed us from our sins and is among us to assist us in our poverty. Guide the flock to which You have promised possession of the kingdom. Send new workers into your harvest and set in the hearts of pastors faithfulness to your plan of salvation, perseverance in their vocation and holiness of life. Christ Jesus, who on the shores of the Sea of Galilee called the Apostles and made them the foundation of the Church and bearers of your Gospel, in our day, sustain your people on its journey. Give courage to those whom You call to follow You in the priesthood and the consecrated life, so that they may enrich God's field with wisdom of your Word. Make them docile instruments of your love in everyday service of their brothers and sisters. Spirit of holiness, who pour out your gifts on all believers and, especially, on those called to be Christ's ministers, help young people to discover the beauty of the divine call. Teach them the true way of prayer, which is nourished by the Word of God. Help them to read the signs of the times, so as to be faithful interpreters of your Gospel and bearers of salvation. Mary, Virgin who listened and Virgin of the Word of God made flesh in your womb, help us to be open to the Word of the Lord, so that, having been welcomed and meditated upon, it may grow in our hearts. Help us to live like You the beatitudes of believers and to dedicate ourselves with unceasing charity to evangelizing all those who seek your Son. Grant that we may serve every person, becoming servants of the Word we have heard, so that remaining faithful to it we may find our happiness in living it. Sometimes, people wonder whether God actually answers prayers. Here is a compilation that was sent to me with a whole bunch of evidence that He does. The only caution I would offer is on the mortal sin question. Yes, the Catechism states that a serious sin is a violation of the Ten Commandments, which of course it is. However, as with anything else, there are degrees. I read an article once about a 2nd grader all stressed out and feeling like she couldn't receive communion because she had disobeyed her parents (a violation of the 4th commandment) and believed that she had committed a mortal sin because she had violated the commandments. The average disobedience of a child, while not desirable and something for the child to confess, is certainly in the "venial" sin category. So, when speaking to children about venial and mortal sin, it is important to emphasize the nature of a "serious" sin. 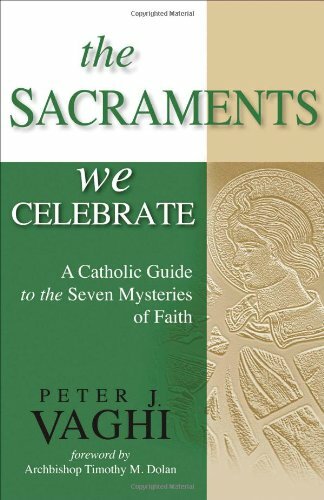 In the introduction to “The Sacraments We Celebrate: A Catholic Guide to the Seven Mysteries of Faith,” Archbishop Timothy Dolan writes that Msgr. Peter J. Vaghi “has baptized hundreds of babies, heard thousands of confessions, celebrated Mass daily, married countless couples, and anointed thousands of infirm and elderly. In other words, he’s been on the front lines of the battle for souls, armed with water, bread, wine, oil stock, purple stole, words, and gesture.” The sacraments are “the front lines of the battle for souls,” yet we Catholics often take them for granted. Msgr. Vaghi’s book is designed both to educate readers about the mysteries of the sacraments and their role in our spiritual lives, as well as to encourage Catholics to make greater use of them. The book is the second of a four part series examining the four pillars of the “Catechism of the Catholic Church.” As such, Msgr. Vaghi quotes heavily from the recently published “United States Catholic Catechism for Adults.” This is designed as a companion volume to that Catechism, but it functions equally well as a stand-alone study. “In the sacraments, each of us encounters God.” Msgr. Vaghi explores in great detail how we encounter God in Baptism, Confirmation, Eucharist, Penance, the Anointing of the Sick, Holy Orders, and Matrimony. 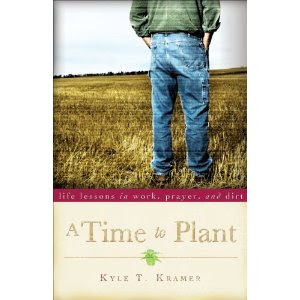 Each chapter includes questions for personal or group reflection as well as a prayer. There is so much to learn about the mystery and gift that is the seven sacraments. Readers of “The Sacraments We Celebrate” will come away with a much greater appreciation for the sacraments and will hopefully seek to integrate them more fully in their lives. It is still a year away, but starting in Advent 2011 there will be a new translation of the Mass. The following are .pdfs with side by side comparisons of the old and new texts. November 2nd is All Souls Day - a day to remember all those who have died, especially those in Purgatory. I am pleased to announce that I am the new assistant editor for the "Love" channel on Catholic Exchange (CatholicExchange.com)I am very excited about this opportunity. I'm also searching for new writers to contribute to the site. The Love Channel focuses on all aspects of human relationships - dating, marriage, parenting, education, suffering, etc. If you blog or have always wanted to write about these topics from a Catholic perspective, I'd be happy to consider your work. You can send it to me at pfmacarthur at comcast.net.